"...a new kind of investment and new class of investor that aims for social impact in addition to financial returns bring new ideas and new sources of capital to tackle problems in the developing world. [They...] define the new trend as investment specifically targeted to create development out- comes in addition to a financial return and map the main players and what we know about this nascent marketplace. They then suggest concrete steps that will help the market mature and grow, with separate and specific recommendations for practitioners, development finance institutions, and regulators." Lack of market infrastructure is a major impediment to the development of the impact investing sector. As More than Money goes on to survey, there are both promising emergent case-studies and compelling lead players having impact. They conclude with a half-dozen or so top action-items for practitioners, development finance institutions, and regulators interested in advancing impact investing. 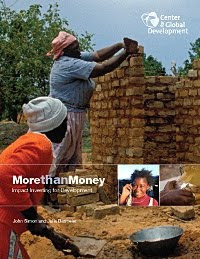 Tune in Mon 13 December 2010 @ 4p EST for the webcast of panel discussion about the report findings.